Historical evidence points to Amsterdam starting out life as a place of Roman occupation. However, it was probably not a large Roman settlement, because archaeological finds on the site are few and far between. History therefore suggests that this area was little more than a swampy tract of land. In the 12th and 13th centuries, many dykes were built, freeing up land and allowing settlements to grow. A barrier was built on the River Amstel, allowing the flood waters of the Zuiderzee to be controlled. It is known that by 1275, a settlement known as Amestelledamme was in existence. A charter was granted by Floris V, the Count of Holland, which allowed toll fees on the Amstel dam to be waived. This was to be a pivotal time for Amsterdam, encouraging trade and allowing it to expand. The second turning point for medieval Amsterdam came in the late 14th century, when some of its canals were constructed, opening up trade still further. The city's merchants exported cloth and salt in return for such commodities as timber and grain. In fact, such was the demand that the port soon had to be extended. In the 16th century, the city came under the control of the Spanish Empire. The main religion in Spain was Roman Catholicism. However, in Amsterdam, Protestantism had taken hold. So too had a particularly fervent branch of Protestantism known as Calvinism. A lack of religious tolerance led to a long period of rebellion by locals against their ruler's beliefs. In 1535, a group of Anabaptists were executed. Then, in 1579, William the Silent created a Dutch republic. The new republic was to be made up of seven provinces, one of which was Holland. 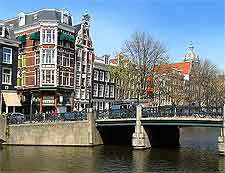 Amsterdam was its dominant city. By the beginning of the 17th century, Amsterdam had grown into a port that had a vast influence over trade between England, France, Spain and Scandinavia. The East and West India companies were set up at this time. As Holland flourished, so too did Amsterdam. Explorers set off from the city to all points on the globe, from South America to New Zealand. The city could soon boast one of the largest ship building industries in the whole of Europe. In 1618, Catholicism was outlawed and many Catholics in Amsterdam were driven underground in their attempts to worship. Finally, in 1648, a century of religious conflict came to an end when the Spanish signed the Peace Treaty of Westphalia. History tells us that from 1700, Amsterdam's fortunes did not fare quite so well. Perhaps the pioneering spirit of those early years had faded. Innovation was replaced by conservatism, while a series of exceptionally cold winters certainly did not help matters. The city's support of the American War of Independence led to British blockage of the Dutch coast. Around the world, many Dutch interests were closed down. The early 19th century was characterised by political instability on a grand scale. In 1794, Napoleon's troops arrived in the Netherlands, followed by counterattacks by the British - all of which didn't do much for trade in Amsterdam. Commercialism gave way to agriculture and the city's harbour was left to deteriorate, with Rotterdam taking over much of Amsterdam's trade. 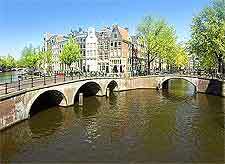 In 1814, the city became part of the newly formed state of the Netherlands. Finally, in the second half of 19th-century history, Amsterdam's fortunes seemed to be on the rise. They were helped along by a recent international discovery - diamonds had been found in South Africa. The diamond industry did particularly well here and before long, the city was once again managing to attract workers. Some of the city's famous canals were backfilled, to be turned into roads. In World War One, the city retained its neutrality. Nevertheless, it did not fare well. Frequent shortages of food let to social unrest in the city. The interwar years were a period of prosperity here. 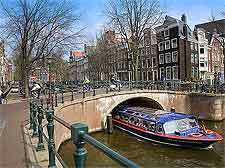 Amsterdam was the most important industrial city in the Netherlands, with a vibrant motor industry, tobacco factories and steel plants. 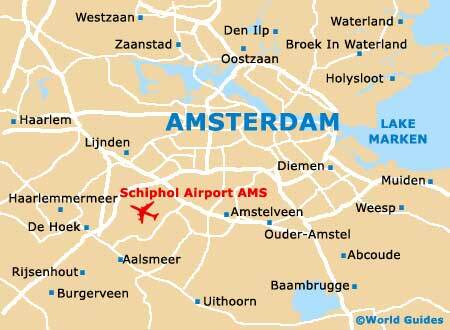 From 1920, it was possible to fly from Amsterdam to London, using KLM's new air service. Amsterdam didn't escape the effects of the worldwide depression of the 1930s. Nor did it escape the tension that existed in Europe as events unfolded that were to lead to the outbreak of World War Two. The city became a refuge for Jewish people escaping from Germany. In 1940, Amsterdam was occupied by German forces. By 1944, the situation in the city was desperate. Fuel stocks were low, food was short and any public services had long since stopped. Many of the city's residents died from lack of food or the cold. In May 1945, the city was liberated by Canadian troops. The post-war period was one of growth for the city. In 1952, the Amsterdam-Rhine Canal was opened. New housing estates sprang up all over the city. These included the Bijlmer, a project that was completed in the 1970s. Today, the Dutch capital retains its status as the largest city in the Netherlands and is also a busy tourist destination, known for its infamous red light district.